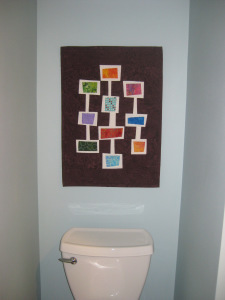 When you are thinking about a good place to hang a quilt in your house, don’t forget the bathroom! Yes, the bathroom! How many of us have neutral colors in our bathrooms in our tiles and toilets and tubs. Even counter tops tend to be neutral. This is true in my bathrooms too but in addition to adding the color of towels to brighten the room, I also add wall quilts. 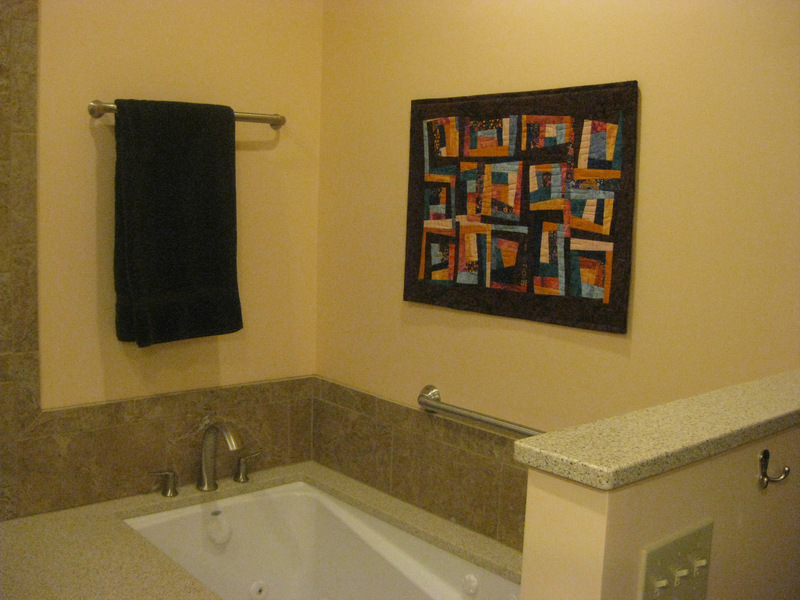 Quilts are perfect for the bath because they are one of the only forms of wall art that can handle the moisture. The fabric of a wall quilt simply absorbs any moisture and then it evaporates. The wall quilt is not affected! When you change the color of your towels, you can change the color of your art easily. 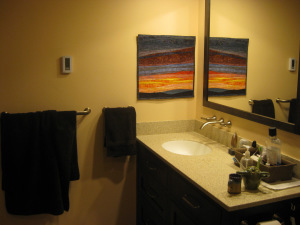 Or, as I have done, I have multi-colored wall quilts hanging in my bathrooms so just about any color towels will work. 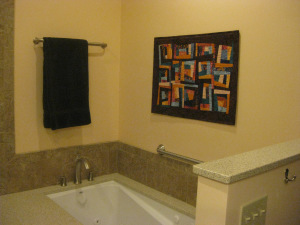 Here are some pictures of quilts hanging in our bathrooms to give you some ideas. This first one is one of my earliest sunsets which hangs so it reflects in the bathroom mirror. I just love this view! This bathroom has no natural light due to no window so the sunset quilt adds a touch of the outside that is missing. This same bathroom has a much larger quilt hanging on the wall by the tub. Again, the splash of color, visible from the tub, reflected in the mirror when we stand at the sink (it is behind and to the right of the vanity), and visible from the shower (to the left of the tub), adds a vibrant touch to the neutral colors every where else in the room. 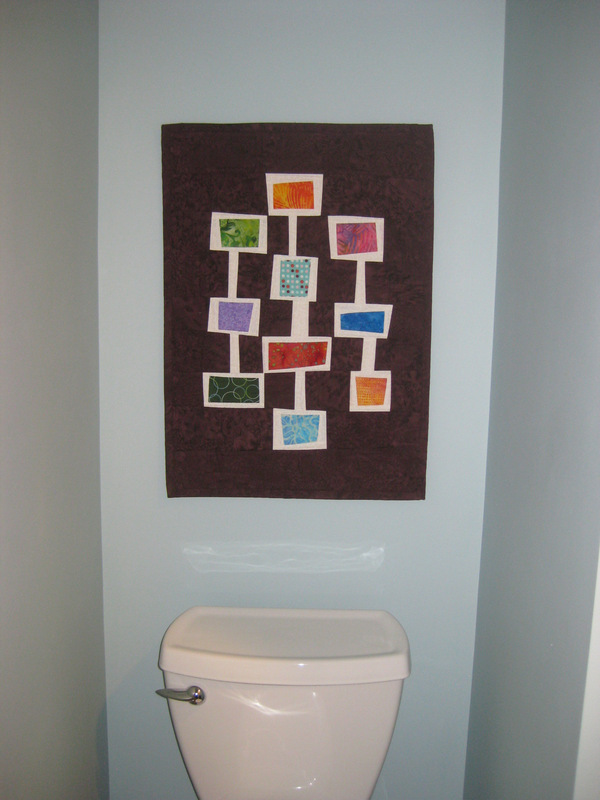 This third picture is a quilt hanging above our toilet in our very tiny powder room. Everyone sees it when they open the pocket door. It completely transforms a small, pale blue room into a dynamic room. I love color but have realized from experience that I can over do it with bright paint in too small a room. Now I improve these smaller spaces with vibrant quilts. So…don’t forget the bathroom when you are shopping for art! !